Happiness – or the lack of it – is a subject that frequently comes up with clients and one we’ve discussed several times in the blog. So many people seem to have forgotten what it’s like to be happy. And we’re not talking about the transient happiness from the latest gizmo or “must have” but a deeper sense of being happy with yourself and your life. Spend time with young children and you’ll quickly see that happiness is our natural state. Our default setting. Yet somewhere along the way we seem to have lost touch with it, so by the time we’re “grown up” anyone who’s happy is seen as “a bit odd”. 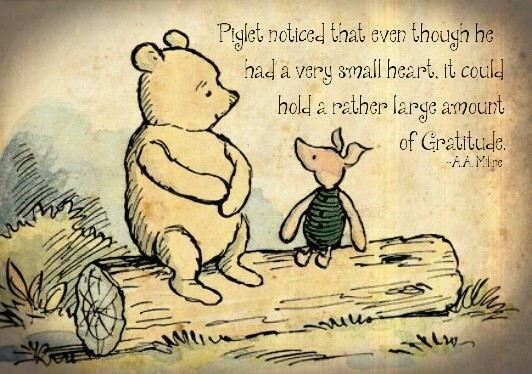 And who doesn't love Winnie the Pooh and Piglet? Getting back in touch with happiness can seem like a rather tall order, but there is a very simple – and quick – way to be happy. And that is to stop and think about everything you’re grateful for at right now. Now the knee jerk response to this is usually along the lines of how can I be happy when I don’t have x, y and z. But this is missing the point. There are ALWAYS lots of things you can be grateful. You just have to look for them. And that is regardless of how bad – or good (!) – things may seem to be. Perhaps you don’t have the home of your dreams yet, but your current home does keep you warm and dry, has good neighbours and is close to where you work. Or your job may not be exactly what you want but it does give you a reasonable income, is convenient and you have great colleagues. You get the idea. Pausing to think about everything you already have and are grateful for puts things into perspective. Those small annoyances don’t seem so important any more. You feel calmer and happier. More positive about yourself and the world around you. And what about those small things that instantly express your gratitude. The ones it’s all too easy to forget about. “Pleases” and “thank you’s.” A smile, pat on the shoulder or hug. A quick phone call or thank you note? Little things really do make a difference, to you and the lucky recipient. Gratitude also makes you more resilient when things don’t quite go to plan. When life throws a spanner in the works. Just think about it for a moment, what helps you more? Stomping around like a bear with a sore head when things don’t go your way or being grateful for all the other things that are going well? Life is always going to throw in the unexpected, it’s just a question of how you choose to deal with it. If you want a quick reminder of how easy this really is, today, as you go about your life practise feeling grateful for everything that comes your way. The sun shining through the window as you’re doing the washing up. The bird soaring in the sky while you’re driving to work. The person who let you go ahead of them in the queue in the supermarket. The song on the radio you haven’t heard for years, but can still remember all the words of. And, more importantly, when things don’t quite go to plan gratitude focuses you on the silver lining. All the things you can be grateful for. You may have got stuck in the traffic but enjoyed singing along to the radio or watching the clouds. Your partner may have forgotten to unload the dishwasher again (!) but they did put the rubbish out or collect the children. • Reduced levels of anxiety and stress as adrenaline and stress levels fall, while those of dopamine, serotonin and norepinephrine rise. So why not take a few moments right now to appreciate all the good things you already have in your life. And, as you do so, you’ll notice many more. Your day instantly becomes better and all those small annoyances drop away.